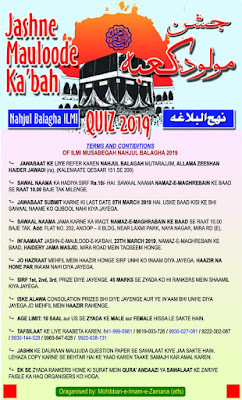 Get a free booklet of Ziyarat of Aashura and Ziyarat of Arbaeen, collect a copy from Zainabia Imambada or Imambada Baaqirya in Mumbai-400003 after namaaz of Maghrabayn on Saturday 14th January 2012. Both the Imambadas are hosting Majlis and shab bedaari at their venues. The shab bedari will also be at Moghul Masjid, Imambada Haideri @ Yaqoob Gali and other places at South Bombay. Also in the western and eastern suburbs of Bombay many Anjumans will be attending shab bedaaris to commemorate the Chehlum (fortieth day of martyrdom of Imam Husain (a.s.). Those who want a soft copy on Pdf can email us their name and email ID tomorrow morning. 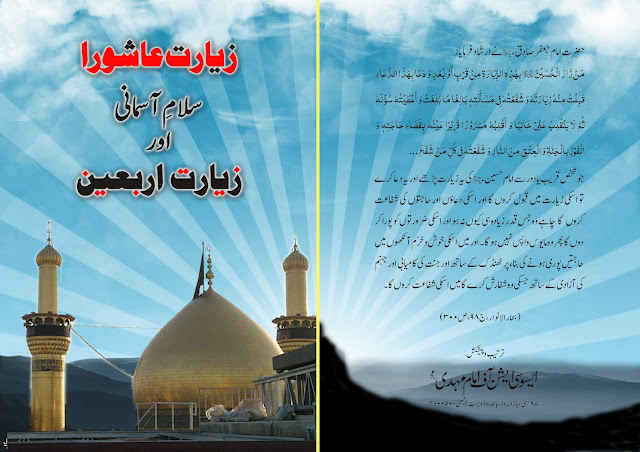 The 32 page booklet is printed and published by Association of Imam Mahdi (a.s.). at which ID to Email? mail at rizvi59@gmail.com for the booklet.